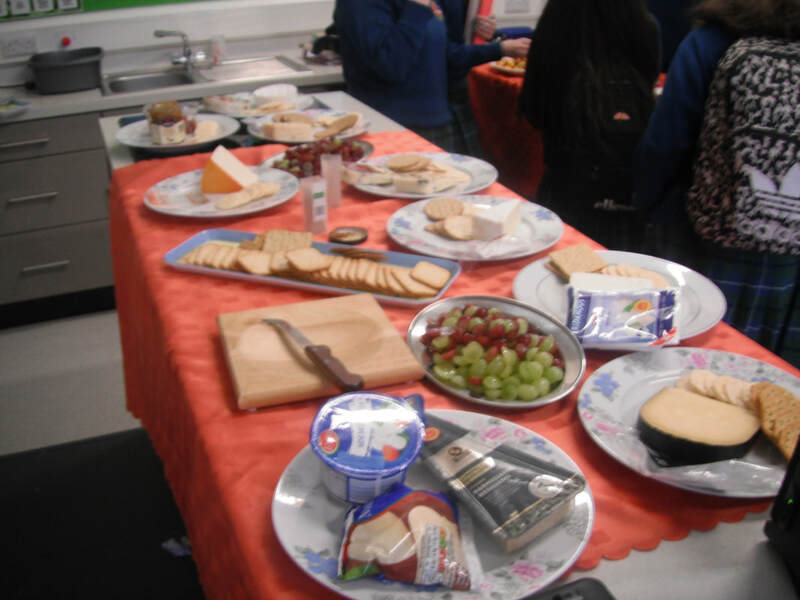 ​As part of Healthy eating week at St Aidan’s,Students and Staff enjoyed tasting a variety of cheeses in the Home Economics room at lunch time. They sampled cheeses from Ireland like the traditional red and white cheddar. An array of other cheese were sampled also , like parmesan, mozzarella, gouda, camembert, brie, port salut, Emmental , wensleydale & cranberry and a few other soft cheeses. Cheese would not be complete without some crackers, grapes and some Moran’s pineapple and red onion chutney .Milk, yoghurt and cheese provide calcium needed for healthy bones and teeth. Calcium is important during the teenage growth spurt and also for older adults. The Healthy Eating guidelines recommend that we choose three servings of dairy foods each day. Choose 5 if aged between 9 and 18 years.